Llangollen is a very fortunate town in many ways. It might not be the most prosperous nor the wealthiest, it might not be the most easily accessible, though in its heyday it was on one of the busiest routes in the British Empire, a busy stop on the carriage from London to Dublin; however times have changed and Llangollen is now marketed as the home of the International Eisteddfod, and a delightfully busy tourist destination for the cities of the English Midlands and north West England. Tourism continues to be the major industry in town. It has some lovely shops, a great patisserie, a fantastic second hand bookshop, nice pubs, well kept hotels, but it is also in need of major investment. The locals feel that they are priced out of the housing market and youngsters are moving away to find a job and a home. The town is lucky because of its people. This statement is true of every community – it is only as vibrant and active as the people who reside there choose it to be. If the residents of a community don’t play their part in keeping that community alive, then it is no more than a fake community, a collection of individual units that will ultimately wither and die. But Llangollen is lucky because it still has that sense of belonging, a pride in its history, and people who are willing to give of themselves to help the community thrive and grow. Powys Fadog, led by Mr. Pol Wong, is a perfect example of this commitment and love of Llangollen, with a keen sense of local pride and an eagerness to see businesses flourish, retain home grown talent and promote the local culture. Pol is unique. I say that as a compliment. He is a proud patriot, has learnt Welsh fluently…and is a Shaolin Monk! He is one of only a handful of Shaolin monks that reside outside of China, and what’s more he is a born and bred Welshman. 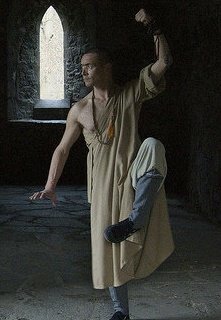 Pol’s unique attributes, his Shaolin Kung Fu education, his contacts with the Shaolin temples of China, his understanding of exercise, nutrition, and appreciation of local history and culture, has given Pol a mission which he feels he has a duty to fulfil. It is this mission that inspired the Powys Fadog project. The vision is simple yet quite extraordinary – to develop a cultural centre at River Lodge Llangollen to teach youngsters the value of self discipline, healthy living, and appreciation of their surroundings through history and community activity all through the medium of Welsh and Shaolin Kung Fu teachings. The centre would aim to grow their own organic foods, encourage enterprise, and give participants a sense of purpose and pride. At the same time it would attract people from across the world, and boost the local economy, making Llangollen an integral link in the increasingly global Shaolin Kung Fu network, but with it’s distinctive Welsh brand. It is an exciting vision, and would bring prestige with it. The people of Llangollen seem to be on board and supportive. The Powys Fadog group have dedicated the past 10 years to develop this project, and have achieved some very notable successes. They have secured major funding, they have secured a lease on the building, River Lodge at Llangollen, from the National Assembly for Wales, and have developed architectural plans. They’ve gone as far appointing contractors to carry out the works. In fact, up until last year they were all set to go and the future was bright (and with Pol in his Shaolin robe the future was also orange!). But all of this is now in jeopardy. The first sign of trouble came from the Local Assembly member, Karen Sinclair. Throughout the life of this project Ms. Sinclair has voiced her avowed disapproval of the project. She has contacted Government Ministers claiming that Powys Fadog have failed to gain financial support and saying that the plan has no local support. She does not support these claims with evidence only personal assertions. Whether she knows it or not the message given out by Karen Sinclair is that she does not support the development of small home grown businesses (at no expense to the public purse – remember that it is a lease), and that she has no respect for the local culture. Secondly, The River Lodge was purchased by the now defunct WDA (Land Acquisition Department) with a view to leasing it out to Powys Fadog. The lease is about to expire, but the project has stalled on the Assembly side because the officers (previously of the WDA now of the National Assembly for Wales) are being investigated for disciplinary action since earlier this year. While the disciplinary charges are being investigated the whole plan has come to a stand still. In the mean while time is quickly running out on the lease. While the internal procedures are of obvious importance to appreciating the Assembly’s position on the situation, it is possible to concentrate too much on the internal procedures at the expense of the wider picture. The fact of the matter is that here is an exciting local project that aims to benefit not only the town but also the wider area, with activities that focus on respect for the self, the community and culture, all of which are high on the Government’s list for tackling social ills, yet it is at risk of failing. I appreciate that the current audit being undertaken into the agreement between the former WDA and Powys Fadog is concerned about the relationship between the WDA officer who made initial contact with the Powys Fadog Group (the officer was made a director of the group, placed there in good faith to ensure representation on behalf of the land owners), and other factors. Yet this information was known and made public at the time of purchase and the lease agreement was signed off by senior managers. Pol ran a successful business from the River Lodge – this was the inspiration for the project. I doubt whether he would want to risk his own business, his income and his way of life on a dodgy agreement with a Government body. It was this burning vision and this desire to marry two geographically distant yet surprisingly similar cultures (Welsh and Chinese) together at the foot of Dinas Bran fort that drove him to developing the Powys Fadog project. He even managed to arrange the visit of highly respected Shaolin monk from China to help develop ideas and bless the venture! I fear that if this internal audit drags on much longer then this exciting project will be lost. This is a worthwhile project that deserves our support. It is innovative projects of this kind which we need in our communities if we are to allow local businesses to develop and give focus and a future for our youngsters.